Holidaying in your own finca is undoubtedly one of the most popular and relaxing holiday options. Privacy, independence and tranquillity are just a few of the great benefits of having your own holiday property, even though it is only rented. The only problem (for some people) is the cooking! Eating out in a restaurant every day seems to be the simplest solution initially, and the island impresses with an immense gastronomic selection for every taste and budget. A communal meal in the holiday finca, however, for two, with the family, or together with friends can definitely be a highlight and does not have to involve going shopping or cleaning the kitchen afterwards. Simply order a private chef ! Private cooking events, including breakfast service, are currently very popular in Mallorca and very fashionable not only with tourists but also with residents. We are not talking about a simple catering service although, of course, this is also possible, but the offers available go well beyond this and are full of surprises. 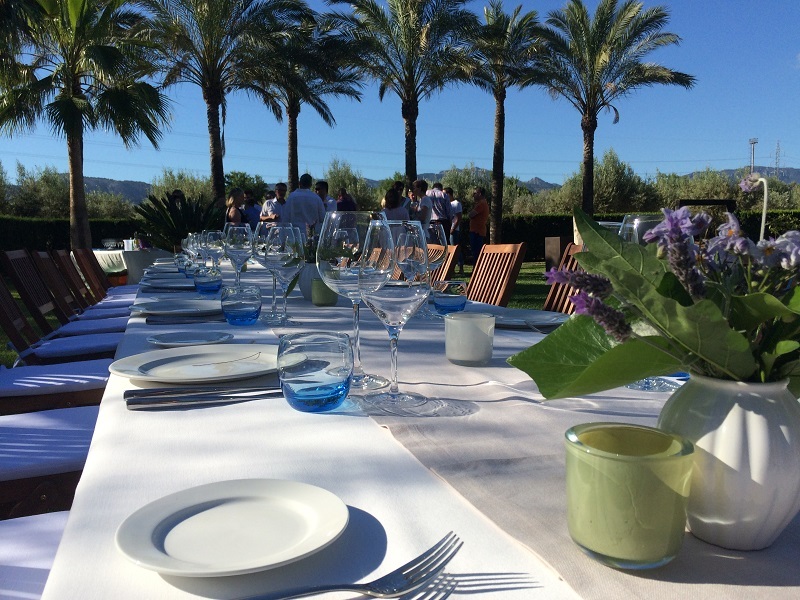 The cooking events do not even have to take place on your finca – some chefs even invite to their own premises or to other kitchens. But regardless of the location, you are the guest. All you need to do is to choose the theme, and you have nothing to do with shopping, preparation or washing dishes. Should anything in your kitchen be used it goes without saying that it will look like new at the end of the meal.. The price range is just as large as the culinary selection and the cost depends entirely on you – even for a lower budget our recommended house chefs can offer a wide choice. 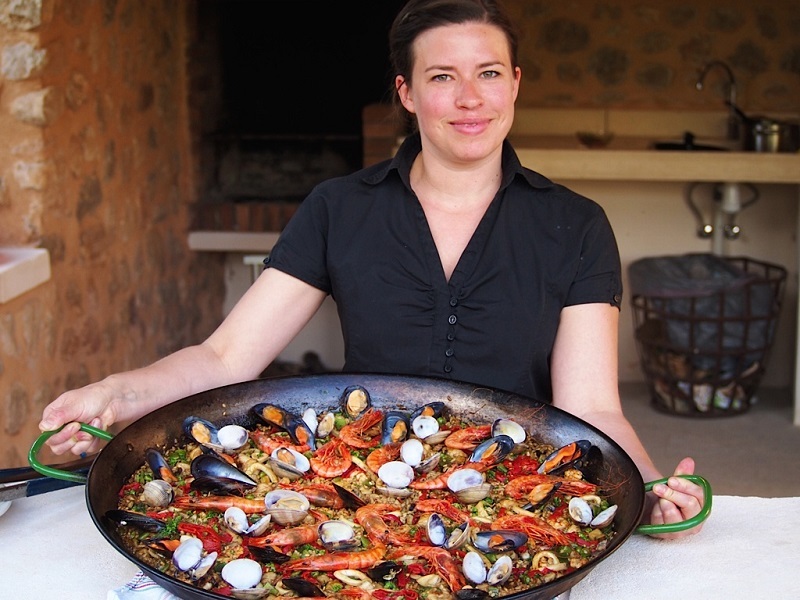 Ten years ago Caroline Fabian set up her own business in Mallorca with Private Cooking Mallorca – with success as the fresh, Mediterranean cuisine of the pleasant lady from Munich, whose final training took place at the Michelin-starred restaurant Es Racó d ‘es Teix in Deià, has been very well received. Whether a gourmet evening, a tasting menu or a 4-day special featuring culinary classics like paella, Mediterranean BBQ, tapas or antipasta & pasta, or even an all-round pampering program, Caroline Fabian is extremely versatile. 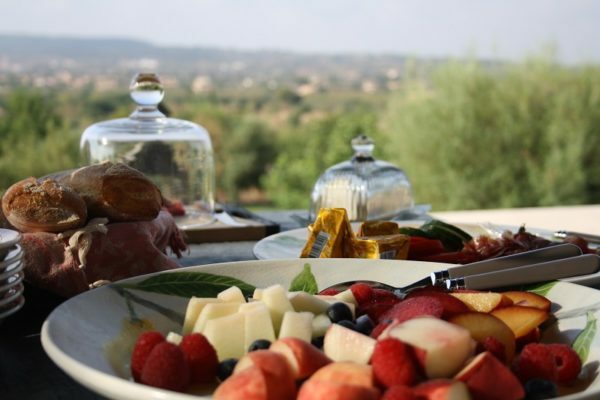 She also offers an impressive breakfast (within 30-40 kilometres of Palma), as well as a shopping delivery service and recently even cooking classes. Caroline can pamper up to 25 guests with her fresh, seasonal cuisine, and smaller wedding parties are also welcome. Apart from her cooking skills, Caroline offers a particularly fine selection of Mallorcan wines. Micha specialises in bringing your holiday breakfast to your table, punctual and fresh every day – no matter where you are located on the island. His cheerful breakfast service is a great way to surprise your loved ones, celebrate a birthday or just to indulge yourself, and even the basic-breakfast is a hit for individualists. A call is sufficient (no later than 3 pm the day before) and the ingredients for your individual breakfast can be decided upon. The deluxe breakfast and the highly luxurious super deluxe breakfast even include, apart from the kitchen service, laying the table. Micha is a professional with years of experience in the hotel and hospitality industry and brings to you everything required for a hearty and delicious start to the day – the eggs are, of course, freshly prepared on the spot and he focuses on Mallorcan products and homemade preserves. For groups and seminars he also offers a breakfast service in the form of a finger-food buffet or champagne reception. For those seeking a special breakfast location he offers a large choice ranging from a roof terrace with views of the cathedral or the marina, to a romantic breakfast on the beach with picnic basket. Even as a child Max spent a lot of time at his grandmother’s side in the kitchen – no wonder that later he made his hobby into a profession and opened his own restaurant in France. The Berliner has been in Mallorca now for almost 22 years with his diverse catering styles and offers. This works so well that he does not need either advertising or a website. ”Word-of-mouth propaganda is the best recommendation” he believes. Starting with breakfasts and continuing over candlelight dinners, birthdays or other large and small private celebrations, company events or champagne receptions – Max offers a feel-good programme for to suit every taste, and his catering can be ordered for only one person up to larger groups of 250 people. ”Afterwards the kitchen is cleaner than before”. He can also bring everything required for an enjoyable evening for larger groups, from waiters and barkeepers to tables, chairs and tableware. Jens Kruse, one of the most established private chefs on the island, has been a welcome guest for 20 years and is also well-known and popular amongst island residents. 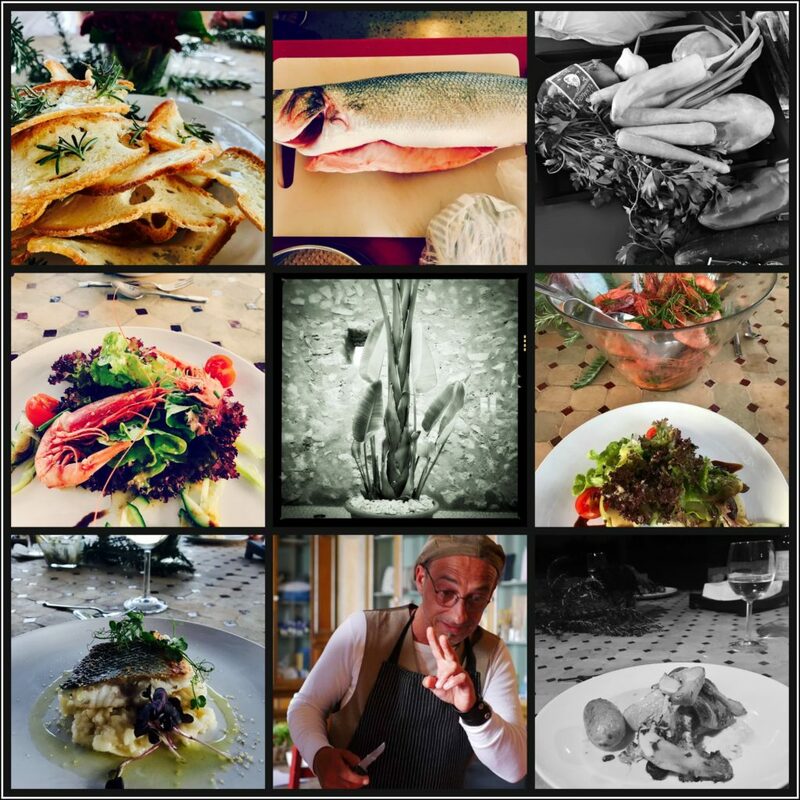 He not only serves delicacies ranging from ‘quite simple’ up to star menus (whilst emphasising that he does not do catering), but also brings along a great deal of island feeling and the Mallorcan way-of-life. Like his colleagues Jens produces everything locally and has already enchanted various celebrities and wedding couples, although it is not necessary to be a celebrity or get married to try out his talents. He likes, for example, carte-blanche surprise menus. He also passes on his tips and tricks in entertaining cooking courses, and even invites you to his own home – with you as the host. Those who would like to cook his creations themselves can find inspiration in his cookbook which he has published together with a colleague. We also like the fact that he does not use any Nestle’s products and generally shops in supermarkets which are still Mallorcan-owned and not, like most, in foreign hands. We do not, of course, want you to deprive you of the Mallorcan private chefs – the chefs from Lonja 18 also come to you on your finca to pamper you with all the good things the island has to offer. They have, however, other things in store for you – in their open kitchen in the heart of Palma they offer cooking classes and reveal the secrets of the traditional Mallorcan dishes. In addition you can rent them, with or without their team, for events ranging from a small but exquisite dinner to corporate activities, for a Christmas meal or for Team-building purposes. The young people of Lonja 18 are internationally orientated, speak Spanish and English, and will make all sizes of events a success whether with catering, a paella-party or a healthy soul-menu, for example for the Yoga retreat with vegan or vegetarian dishes. A wonderful experience is also the shopping tour accompanied by the food-experts of Longa 18 through the market of Santa Catalina.